A deadly arctic deep freeze enveloped the Midwest with record-breaking temperatures on Wednesday, triggering widespread closures of schools and businesses, and the canceling of more than 1,800 flights from Chicago's airports. The U.S. Postal Service even took the rare step of suspending mail delivery across much of the region. Hundreds of public schools and universities from North Dakota to Pennsylvania canceled classes as residents huddled inside amid one of the coldest air masses in years. The bitter cold is the result of a split in the polar vortex that allowed temperatures to drop much farther south than normal. 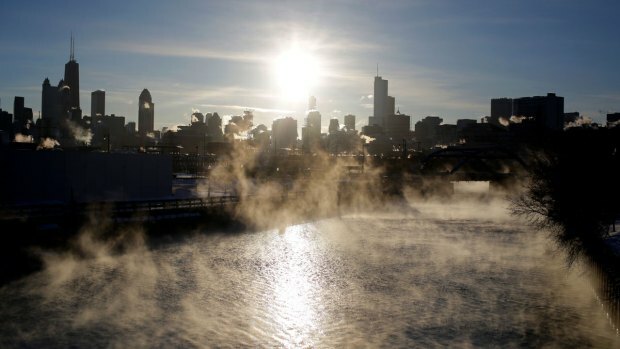 In Chicago, temperatures were still dropping after plunging early Wednesday to minus 19 degrees (negative 28 Celsius), breaking the day's previous record low set in 1966, though wind chills in northern Illinois made it feel as cold as negative 57 degrees (negative 49.4 Celsius). The city was colder than places like Siberia, the South Pole and Mount Everest. 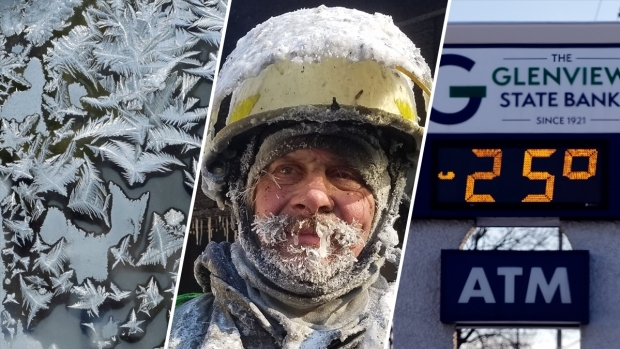 Take a look at the impact the cold weather is having on the Midwest as it faces bitter cold temperatures across the region. "Just brutal," NBC 5 meteorologist Andy Avalos said from Chicago. Snowplows were idled overnight in southeastern Minnesota, where temperatures dropped to negative 29 degrees (negative 34 Celsius). And the temperature in Fargo, North Dakota, was 31 degrees below zero (negative 35 Celsius). Officials throughout the region were focused on protecting vulnerable people from the cold, including the homeless, seniors and those living in substandard housing. Some buses were turned into mobile warming shelters to help the homeless in Chicago. More than 1,500 of Wednesday's canceled flights in Chicago were at O'Hare International Airport, one of the nation's busiest airports. United Airlines spokesman Charlie Hobart said "everything tends to slow down" during severely cold weather, including manpower, fueling and equipment. Calling the temperatures "dangerous," Hobart said United was bringing in extra workers and providing heated tents for employees. All Amtrak trains going to and from the city were also canceled on Wednesday. Major Chicago attractions including the Lincoln Park Zoo, Art Institute and Field Museum weren't opening. A popular saying goes: "Neither snow nor rain nor heat ..." will stop the mail from being delivered, but extreme cold did so Wednesday. The U.S. Postal Service has suspended mail delivery in parts or all of several Midwest states including North Dakota, South Dakota, Nebraska, Kansas, Minnesota, Wisconsin, Iowa, Illinois, Indiana and Michigan. "These (conditions) are actually a public health risk and you need to treat it appropriately," Chicago Mayor Rahm Emanuel said Tuesday. 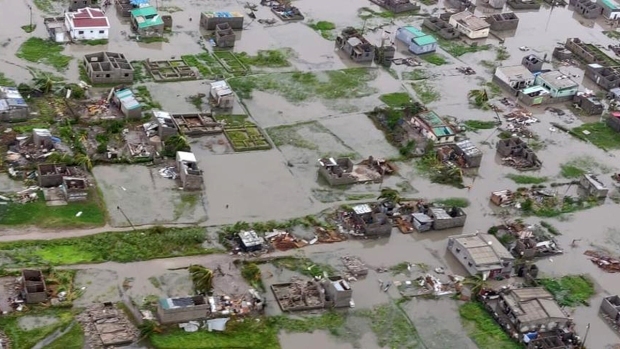 "They are life-threatening conditions and temperatures." In Michigan, homeless shelters in Lansing were becoming "overloaded," Mayor Andy Schor said. They also were filling up in Detroit. "People don't want to be out there right now," said Brennan Ellis, 53, who is staying at the Detroit Rescue Mission Ministries. At least six deaths have been linked so far to the weather system, including two people in the Detroit area, according to local police. 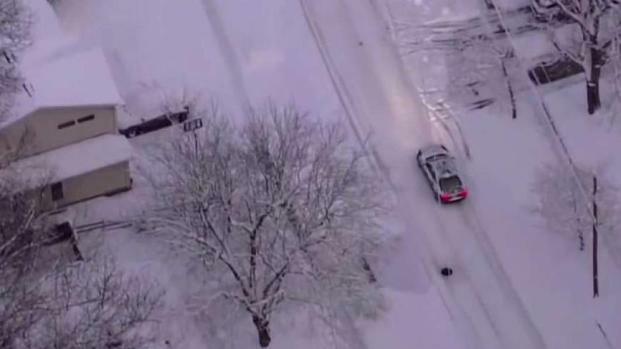 Other deaths included a man struck and killed by a snow plow in the Chicago area, a young couple whose SUV struck another on a snowy road in northern Indiana, and a Milwaukee man found frozen to death in a garage. Bitterly cold weather is a nuisance for some and a danger for others. Officer Laurie Reyes urges people to call 911 if they see someone under-dressed or in need of help when the temperatures plummet. News4's Jackie Bensen reports. Hawaii native Charles Henry, 54, was staying at a shelter in St. Paul, Minnesota, and said he was grateful to have a place to stay out of the cold. "That wind chill out there is not even a joke," he said. "I feel sorry for anybody that has to stay outside." Chicago turned five buses into makeshift warming centers moving around the city, some with nurses aboard, to encourage the homeless to come in from the cold. American Indian tribes in the Upper Midwest were doing what they could to help members in need with heating supplies. The extreme cold was "a scary situation," because much of the housing is of poor quality, said Chris Fairbanks, energy assistance program manager for the White Earth Band of Ojibwe in Minnesota. But it wasn't stopping one of America's most formidable endurance tests: the three-day Arrowhead 135 was going on as scheduled in northeastern Minnesota. Competitors can cover the race route by bicycle, cross-country skis or just running. Associated Press reporters Caryn Rousseau and Don Babwin in Chicago; Corey Williams, David Runk and Mike Householder in Detroit; David Eggert in Lansing, Michigan; and Jeff Baenen in Minneapolis contributed to this report. AP Science Writer Seth Borenstein also contributed.